This week, the California Office of Administrative Law announced new rules that will govern how California employers may use information on a job applicant’s criminal history when making hiring decisions. The new regulations are slated to take effect on July 1, 2017, and employers are advised to begin planning now regarding how they will implement these new restrictions. Under the new regulations, California employers will be allowed to seek out and consider the criminal history of employees or job applicants only when the information they seek is “job-related and consistent with a business necessity.” Employers will need to use one of two methods to show that information is job-related: either a bright-line conviction disqualification; or an individualized assessment of the applicant that has been affected by the conviction screen. Under the bright-line policy, the employer will need to demonstrate that their conviction disqualification policy excludes only employees who would pose an unreasonable risk if hired, and that the conviction would have a “direct and specific negative bearing” on the applicant or employee’s ability to do the job for which they had been hired or were being considered. If the conviction-related information being considered is seven or more years old, then the employer would be obligated to show that the information was sufficiently job-related; otherwise, this older history could not be included in an adverse employment decision. 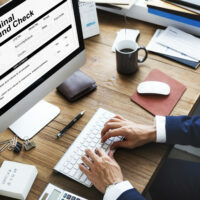 Under the individualized assessment method, employers will need to notify an employee or applicant that they have been screened out due to their criminal conviction. The employer must offer the employee an opportunity to respond to these concerns and show that an exception should apply to them before any adverse action is taken, such as the employer refusing to hire the applicant. If information on a job applicant’s criminal background is obtained through some source other than the applicant themselves, then the employer is now required to alert the employee to this fact, and offer the employee a chance to correct the information that the employer received. One example of such a source would be a third-party background check. The employer must provide this notice before they take any adverse action against the applicant or employee, as well. If you’re an employer who wants to know how this information might affect you and your hiring decisions, contact the skilled and detail-oriented Bay Area employment lawyers Richard N. Koss & Rand L. Stephens for a consultation, in Antioch at 925-757-1700, or in Redwood at 650-722-7046.